Now I have to say I had serious reservations about my manual citrus juicer or citrus press as they are sometimes refer to. I thought they might be all trendy design and lacking in action. However I was wrong! In this instance I really don’t mind admitting I was wrong. I though this juicing press was just a trendy accessory to sit on your worktop. One of those gadgets that everyone admires but no one really uses. But it really does work. 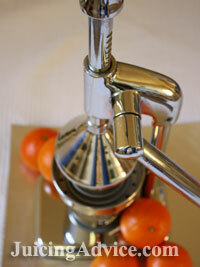 Because I was rather sceptical about this manual citrus juicer I was reluctant to splash out much cash on it. 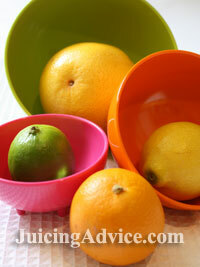 I also have an electric citrus juicer and a masticating juicer so my need wasn’t that great. Having seen this nearly new looking one in the photo for sale in a charity shop I thought I’d give it a go. I haven’t got a clue who it’s made by but I can tell you it works amazingly well. It produces a large level of juice from my oranges and strains the pips and pulp without having to over exert my arms. One thing I would say is if you’re not fortunate enough to pick up a second handy bargain priced one then do buy a quality make. It’s become apparent to me that many people have bought cheap model and the pressure arm has broken. In my quest to find a model to review one particular brand shines out above the rest and this is the Hamilton Beach 932 commercial citrus juicer. Why I have chosen this manual citrus juicer is because of it’s quality, this means it no way near the cheapest on the market. But I believe this juicer is worth it and will last you a long time. It’s so easy to use and has the added advantage over mine that you are able to place your glass straight underneath it. Its attractive design is also very functional. You can exert a large amount of pressure through the lever designed with its rack-and-pinion gearing to extract the juice. It also stays well placed on the worktop and doesn’t tip when in use and has a non-slip base. The clever drip catcher also minimised your mess on the worktop. This juicer is quick and easy to wash up. One down side to this type of manual citrus juicer is it is rather tall and doesn’t fit into your average kitchen cupboard. But they are rather good looking and don’t take up too much space on your worktop. To be honest I quite like my juicing machines out on the worktop then they get used more often.